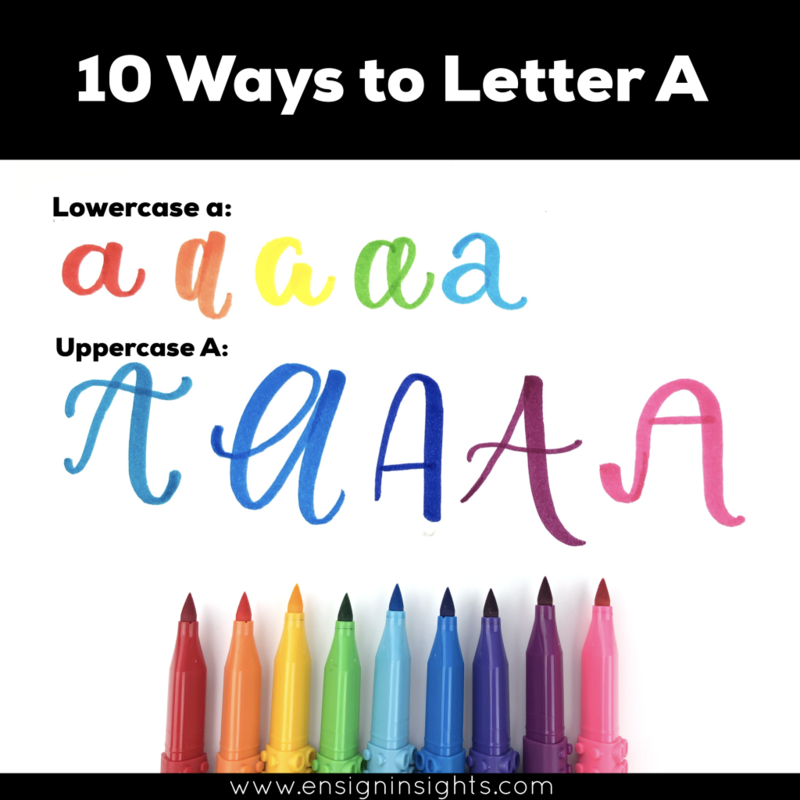 I’m sharing with you how to hand letter A in 10 ways. 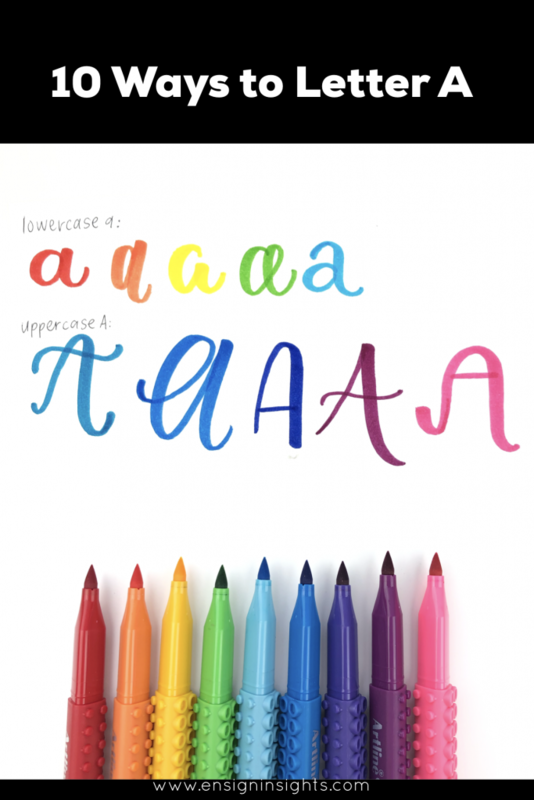 This is uppercase A and lowercase A using brush pen lettering. I am a firm believer that there isn’t one way to letter each letter. You get to create your own lettering style. I hope these 10 ways to hand letter A gives you some lettering inspiration! Is this image helpful? Pin it for later! Feel free to practice the letters in this image! The pens used for this post are Artline Stix brush markers. (amazon affiliate link). In my Insider Scoop (weekly newsletter) I email a free lettering practice each week. Right now I’m sending my 26 Ways to Letter practice sheets. I hope this gives you some brush lettering inspiration to branch out and create your own style. Along with the free practice sheet, I also give a Scoop of Confidence where I share something about confidence in lettering that has been on my mind for the week. My goal is to create confidence, one letter at a time. Below is the one for letter A. When I started lettering, there was one person that I wanted to be exactly like. I would practice her style exactly. I could never see my lettering as good enough because I could never get it to look just like hers. I started to realize how this was hurting me. I decided that I needed to change that. Since then, I have spent hours and hours creating my own confident style and then even more hours to create a process I could share with others. That’s all in my Confident Lettering Style course so I couldn’t give you all of it right here. So for today’s Scoop of Confidence, I encourage you to start looking at all different fonts and styles and lettering artists. Find the little things that you like about each one, and notice the things you don’t like. It’s okay to love a style, but not want certain aspects in your own style. Don’t get stuck on the fact that one person has a certain amount of followers, so that must be the right way to letter. Your lettering is going to be unique to you! That’s what makes it so beautiful! Do you want to practice your letters with me? Here is my YouTube video with 26 Ways to Letter A. 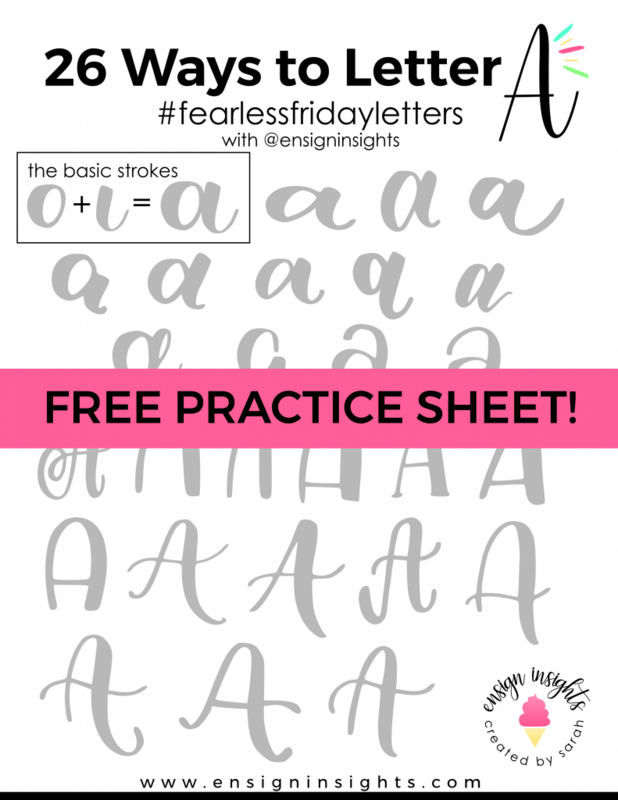 If you liked what you read here and you want to get a free lettering practice sheet each week, sign up for the Insider Scoop!